MERLOT, the granddaddy of open educational resources developed by the California State University system, has entered its third decade of operation with a new facelift. The project, as always, provides a gateway to OER. But with its newest release, search functionality has been expanded and coding has been done using responsive web design to make it mobile device-friendly. Dubbed MERLOT (to distinguish it from MERLOT II, the previous edition), the latest edition features a new, simplified home page, intended to provide an easy and familiar way for instructors and students to hunt down resources. Those OER materials may reside in the MERLOT repository, in one of a dozen digital libraries or on the web. Users can also type in ISBN numbers to find matches that way. "Smart Search," as the new search functionality is called, now includes a "recommender" function that infers the user's search objectives to provide additional results. Also, context-sensitive help has been redesigned and extended. 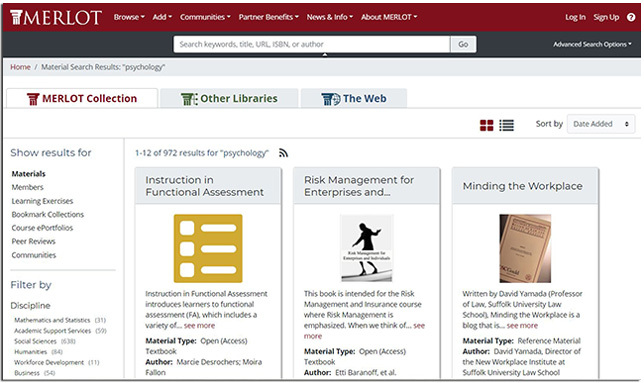 MERLOT's tools already include the ability for registered members to create bookmark collections and course e-portfolios, and to add new open learning materials that can be shared. Registration is free. "Over the years, faculty wanting to adopt high quality, cost-effective [OER] have had difficulty finding them," said Sorel Reisman, MERLOT managing director and Fulbright OER specialist, in a prepared statement. "MERLOT has historically provided a solution to this challenge. Our new release, extending our proprietary smart search with an intuitive user interface, now makes this challenge easier than ever." The MERLOT site receives more than a million visits each year, providing visibility to 80,000 free, online digital resources for learning, including links to 5,700 open textbooks. In the California State University system, the Affordable Learning Solutions Initiative uses the MERLOT cataloguing system as the open access textbook repository to help faculty within CSU, California community colleges and other university systems choose more affordable, quality, educational content for their students. The updated system is available on the MERLOT website.